It was brought to our attention that the possibility existed that a competitor may have submitted on YELP! in 2012 a negative review against our company and as well three other competitors. We cannot say absolutely that the company in question submitted phony negative reviews, but we can say that YELP’s algorithm certainly failed to detect the obvious appearance of nefarious activity. Simply put, it doesn’t work the way they say it does. YELP! states on their website: “Yelp uses automated software to recommend the most helpful and reliable reviews for the Yelp community among the millions we get. The software looks at dozens of different signals, including various measures of quality, reliability, and activity on Yelp. The process has nothing to do with whether a business advertises on Yelp or not.” We disagree. Observe below how one company may have targeted four competitors, ourselves included, and that YELP’s algorithm failed to detect, much less stop it. Meet Div “The Caro” G., who is supposedly a woman. Her favorite movie listed is the 2006 crime drama, “Departed”, which is about an Irish mafia figure and a Boston cop. Forget about When Harry Met Sally, Dirty Dancing� or Titanic, this gal likes rough and tumble wise guy movies. You gotta love a girl like that. But of course YELP! cannot ascertain the gender of any user nor their identity, so this gal could just as easily be a guy. YELP! users are anonymous and may hide. The Div profile photo is an animated character, of course, so she could be a he, which would make more sense in regards to the mob movie Departed. Anyway, she-he has a lot to say about car shipping brokers. 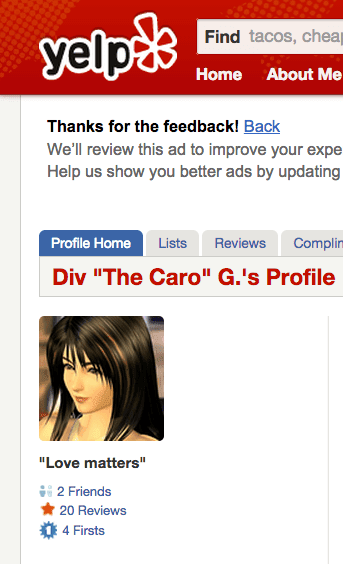 The first thing Div “The Caro” G. does upon setting up her brand new YELP! 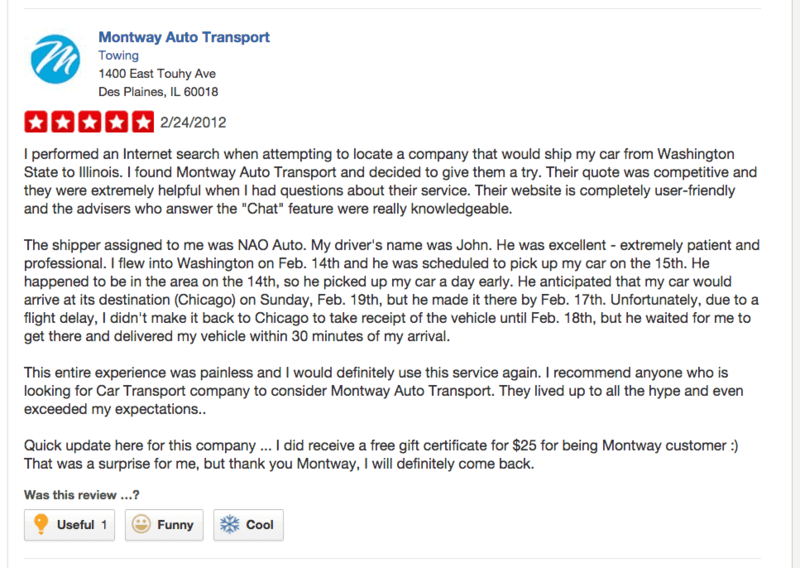 account on February 24, 2012 is enter two restaurant reviews and one glowing 5 Star review for Montway Auto Transport, a broker based in the Chicago area. Well isn’t that just so nice. We didn’t realize there was that much hype, but evidently Div heard all the talk on the street. She almost sounds in love. And it was so considerate of her to remember the Chat feature and gift certificate. 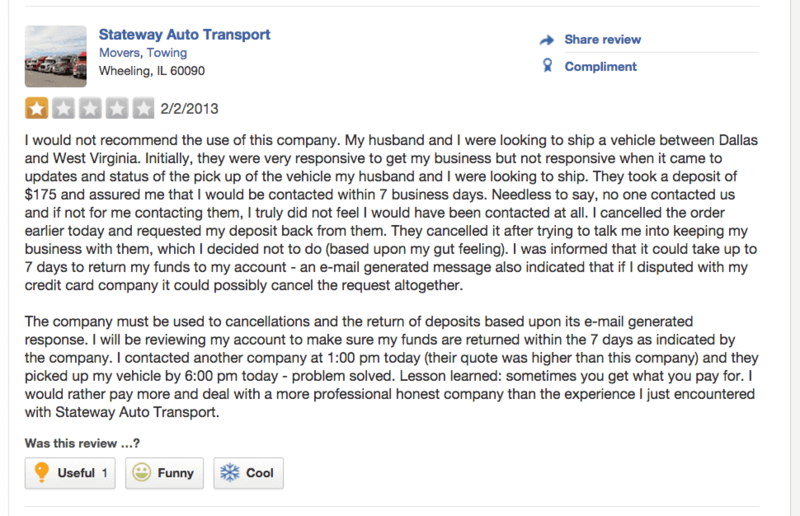 Exactly one month later on March 24, 2012, Div “The Caro” G. submits a negative 1 star review about our company, Direct Express Auto Transport. We’re not feeling the love, Div. We are rated 5 Stars on TrustPilot, TransportReviews and Google Plus, each with over 100 reviews and requiring accountability. We answer those reviews. We ignore YELP! because posters are anonymous, and might actually be competitors. Imagine that? We also refuse to give in to extortion and will not advertise with YELP! and judging from their recent stock plunge, more businesses think the same. Our ratings suffer as a result and it hardly matters because 98% of our visitors don’t check them out, as well they shouldn’t. People know not to trust YELP! We notice Div makes no reference to an order number, vehicle shipped or shipping locations. The only thing we have to go on is the unique name “Div”, and we can find no customer in our records fitting that. It also makes no sense that Div would switch brokers if she was so happy with the other leading brand. People don’t switch if they are happy with their hairstylist, mechanic or broker. Nearly 25% of our business is repeat. YELP! does not detect the unusual activity because their algorithm is not sophisticated enough to do that. This negative review submitted by Div was recommended by YELP! and counted in their manipulated ratings. We do not know whether the author is Div’s first broker reviewed, but YELP! should have detected something highly unusual with the odd sequence of events and failed to do so. Ouch. Not nice Div. And likely fabricated. We have never spoken to Lepke but do know he is regarded higher than that. Once again Div makes no reference to an order number, vehicle shipped or shipping locations. That gives Lepke very little information to research the supposed customer order. It makes very little sense that Div would stray once again from her allegedly happy 5 star experience with the first broker. While using grammatically flawed English and poor syntax, Div is critical of others for their English skills. 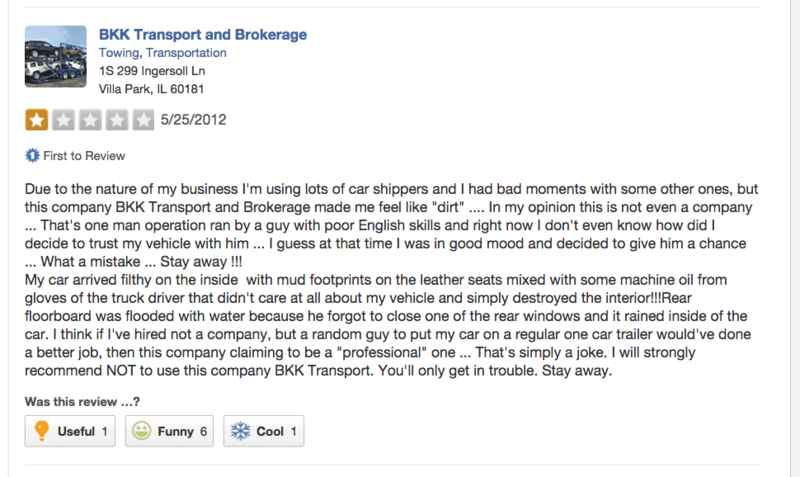 We note that Lepke, like us, is rated 5 stars on transportreviews.com. We do not know whether the author is the first broker, but YELP! should have detected something highly unusual with the odd sequence of events. Read that first sentence again for BKK … Div realizes she needs to explain why so many reviews about auto transport brokers (the frequency that most people review restaurants), because yeah, it’s getting kind of weird. We will say it again, why does Div keep trying different brokers? YELP! cannot detect an obvious case of potential fraud. We have never spoken to BKK but do know he is regarded higher than that. And again Div provides no reference to an order number, vehicle shipped or shipping locations, giving BKK nothing concrete to research. While using grammatically flawed English and poor syntax once again, Div is critical of others for their English skills. Usually when a person has not quite mastered the English language, they are more forgiving of others. But not Div. We do not know whether the author is the first broker, but YELP! should have detected something highly unusual with the odd sequence of events. Eight months later on February 2, 2013, Div “The Caro” G. took her final swing at another auto shipping broker, submitting yet another negative 1 star review about a fourth company, Stateway Auto Transport. Again Div makes no references to an order number, vehicle shipped or shipping locations, giving Stateway nothing significant to research. She ponders Stateway’s cancellation rate, which is an unusual thing for a customer to write about. We point out for a final time that Div is using a fourth broker after she supposedly was satisfied with her first broker. What normal person does that? We note that Stateway, like us, is rated 5 stars on transportreviews.com. We do not know whether the author is the first broker, but YELP! should have detected something highly unusual with the odd sequence of events. Soon after the fourth and final negative review against Stateway Auto Transport, Div “The Caro” G. stopped reviewing altogether. There have been no reviews submitted by her (or is it he?) about any business in two years, which after 20 total reviews (5 on auto shippers) in one year, the sudden prolonged silence is noteworthy. The erratic reviewing behavior of Div should be a red flag to YELP. Div’s negative YELP! reviews live on even if Div does not. YELP’s statement, “The software looks at dozens of different signals, including various measures of quality, reliability, and activity on Yelp”, is nonsense. YELP! measures advertising payments and adjusts their ratings accordingly. That’s their algorithm. It is very unusual and suspicious that any reviewer would begin their YELP! tenure rating an auto transport company 5 stars and then go on to hammer four of its competitors with 1 star each. Helloooo! YELP! failed to catch that behavior because they do not really have that capability, or simply don’t care. It actually is in YELP’s best interest not to catch that sort of thing because the victim might pony up to have it removed. Even if the first competitor did not orchestrate the phony negative reviews of those following, the mere appearance of impropriety is readily apparent and enough to hide those offending reviews. Small business owners run the very real risk of seeing their ratings drop if they do not cave to YELP! Local merchants are especially vulnerable. Do that with a gun and you go to jail. Do that with a website, however, and it’s called “hard bargaining” by the U.S. 9th Circuit Court of Appeals in San Francisco (September 2, 2014). 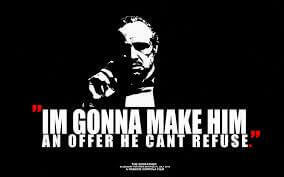 When the Godfather said, “I’ll make you an offer you can’t refuse”, it would have been lost on the 9th Circuit that it was a threat. That’s called “hard bargaining” in San Francisco, not a threat. However, YELP! employees count on Main Street America knowing the difference even if the 9th Circuit doesn’t. 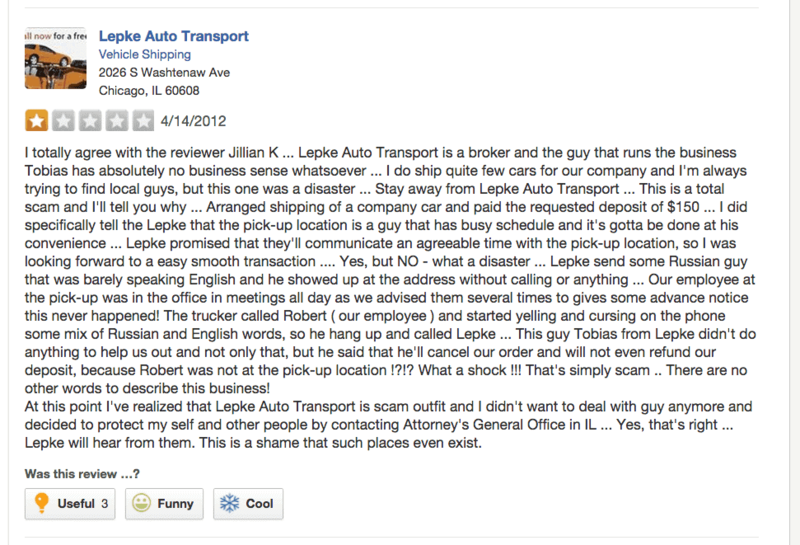 Direct Express Auto Transport decided a few years ago not to advertise with YELP!, accusing them in writing of extortion. We could afford the luxury of snubbing YELP! because we are successful despite their shady business practices. We are rated 5 Stars on TrustPilot, TransportReviews and Google Plus, each with over 100 reviews. Our company statistics reveal that 98% of our visitors, not just customers, do not visit our YELP! page. We miss the 2% that do saunter over to YELP!, but it is not enough to offset the cost of YELP! advertising. In other words, we would lose more than we gain. Apparently more and more businesses are coming to the same conclusion. By the way, Direct Express Auto Transport originated the instant online auto transport quote calculator and it is still unmatched in quality and reliability. “Morally Bankrupting type of environment. Never in my years have I seen such blatant disregard for the truth. The “algorithm” is flawed and hurting small business nation wide. Told to hush up about “the little people” and that the “algorithm” was not to be changed. You will be asked to fight “flagged reviews”, in order to leave them on people’s accounts, regardless of truth. I have never seen a business refuse to remove information that is being asked to be removed, either via email or lawsuit. 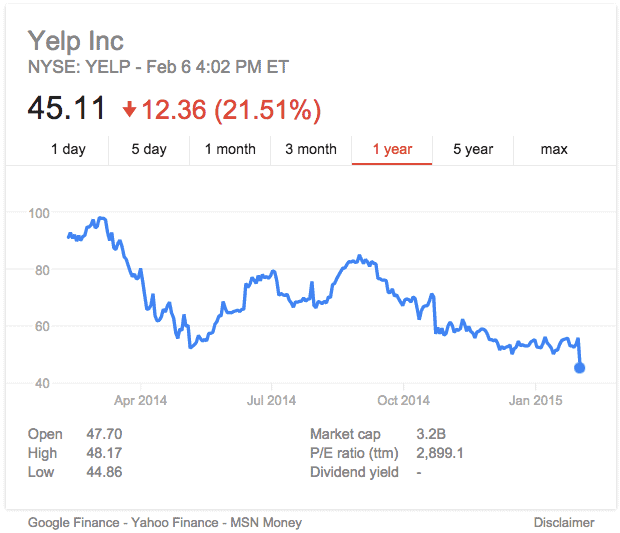 Fun fact, YELP in fact DOES charge to remove bad reviews, via Cold Calling from their sales staff. -Territories are not fair. Most small business owners you’ll be calling have been pitched to at least five times and said no five times in the past few years. -Digital Plantation. Managers walk around and make sure you’re always on the phone. Unrealistic metrics expectations- 80+ calls, 2.5 hours on the phone, 5 appts and 3 pitches per day. – Selling product that doesn’t work for lots of businesses- loses people money. -You’re constantly being sold on how awesome your job is and how lucky you are by management when in reality everyone there is miserable. Feels like brainwashing. Something is just really off about this place. -Crazy turnover. 50 people are being brought in and leaving every month. They take recent grads who have to move into expensive New York City and rent apartments when they know the chances are most won’t even last a year. -Commission doesn’t start until you hit a certain number- usually takes over 6 months. Horrible base salary. -They sell you on room for growth, but very little opportunity. From the very first day I started I kept my resume posted online and actively networked with recruiters for any opportunities that came alone. Every single one of them told me to remove every reference to Yelp from my resume. Every recruiter had been told by the HR teams they worked with to never forward any resume from anyone who had ever worked for Yelp because of their lack or real business experience, lack of professionalism, and lack of legitimate skills. Yelp only hires people with very limited or no experience so they have nothing to compare it to. The company has an extremely bad reputation with businesses both big and small. You will not make your goals. It’s a mill that just uses people for sub par wages. It eats them up and spits them out. Ask yourself why they have such massive and perpetual turnover and that says it all. It’s just a bad company. The people that think it’s great are clueless hipsters who are so blindly ignorant that they cannot see for themselves they are working for a failed company. The incompetent are promoted. if you’re over 25, your manager will be younger than you. Extremely unprofessional work environment and absolutely ridiculous management. Only 20% of the employees in the scottsdale office have been there longer than 6 months. 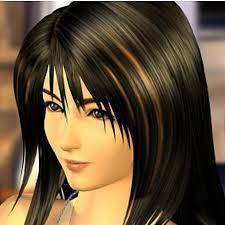 You will watch all of your friends get fired, and then you will get fired. NO JOB SECURITY. Even if you are a top performer, they will fire you if you have ONE bad month. DO NOT TAKE THIS JOB IF YOU DO NOT HAVE INSIDE SALES EXPERIENCE. The PAY is horrible. You will make just enough to pay rent and bills and be able to hit the bar a few times a week. The recruiter is lying when they tell you that you will make commission your first year. You have to sell over $100,000 first, then you can make commission.